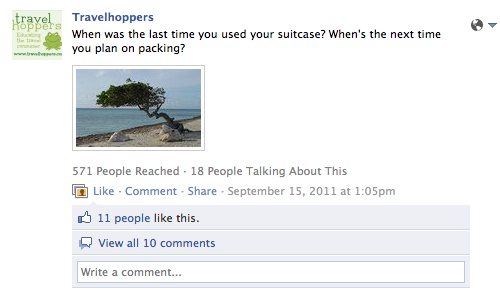 Engagement is the art of pulling your Facebook friends and fans into the conversation. When a Fan Likes, Shares or Comments on your Status Updates, your brand receives a higher profile and is exposed to new people. Engagement is the real measure of the success your Facebook Page is at any moment enjoying. Open questions are one of the best ways to invite engagement. Ask a question not answered by a “yes” or a “no”. Center your questions on travel, but make your question non-threatening and certainly not overtly commercial. As people respond to your question, Like their answers. This small act re-involves them and, importantly, rewards them for their participation. When your question involves a topic that might potentially be a lead (“Where do you most want to travel?”) follow up a week or so later with an email to your Fan if you know them. Open questions give your Fans the opportunity to participate in a conversation with you, your other Fans and to express something personally important. Naturally, you want to vary your posts, and not every post should follow any one format! Mixing open questions with travel quotes and the other suggestions this week will provide you with the strong engagement potential your Facebook page needs to organically grow.